I have something to say that not everyone is going to like…. Ahem, back off of the pumpkin spice! Okay, okay, please put down the torches and pitchforks. Let’s not get overly dramatic here. Don’t get me wrong, I love fall and pumpkin spice. It’s my favorite season, but its just not here yet. We still have a couple of weeks of summer left. So put down the pumpkin puree and make use of the delicious late summer produce we have while its still available. Trust me, there will be plenty of time for pumpkin spice and apple cider everything. 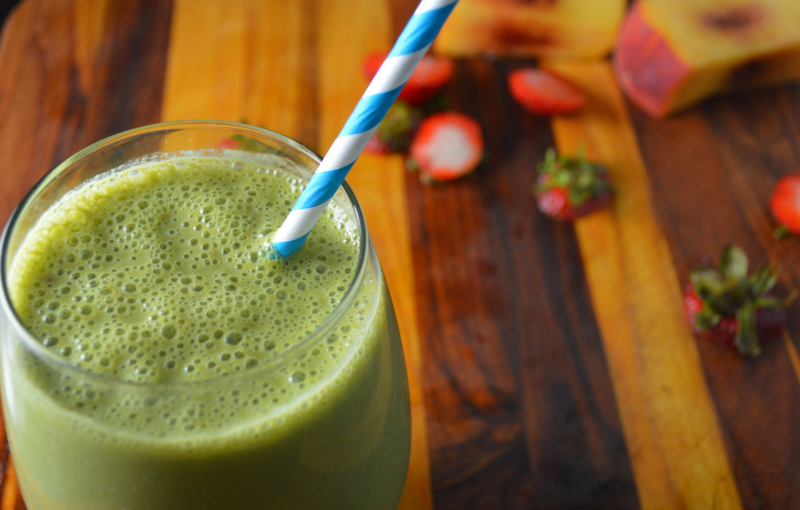 Trade your apple pie oats for this late summer produce smoothie. It is filled with spinach, strawberries, peaches, almond milk, yogurt, and honey. Its delicious, filling, and fast. Smoothies are my go to breakfast and I always pack them full of greens. Spinach is my favorite, but I frequently use kale and watercress if I have it on hand. You can even use a mixture of greens. They up the nutritional value of your breakfast, and I would rather drink them instead of sitting down to a huge salad. Oh, and did I mention you won’t be able to taste the greens? It’s true. I hate how metallic spinach can taste, but blend it with strawberries and peaches and you won’t even know its there. Well, if you’re blindfolded. The drink is super bright green, so… put it in a travel mug for picky eaters and you’ll be good to go. Start by blending your greens, about 2-3 cups worth. I know its an extra step, but I do this separately before I add all of the other ingredients. I like a silky smooth texture, rather than having little flecks of spinach throughout. I find that blending the spinach for a couple of seconds first makes it quicker in the end. Next, add the remaining ingredients. Blend until you are happy with the consistency. You might have to add more almond milk or a few ice cubes to get it just right. This makes enough for two very generous smoothies. Pour it into a fancy glass or travel cup and enjoy! *you can also use a drizzle of honey if your strawberries are extra tart and you are using plain yogurt. Add the spinach to your blender and blend until smooth. This should take about 30 seconds or so. I have a Vitamix which I love and cannot recommend enough! 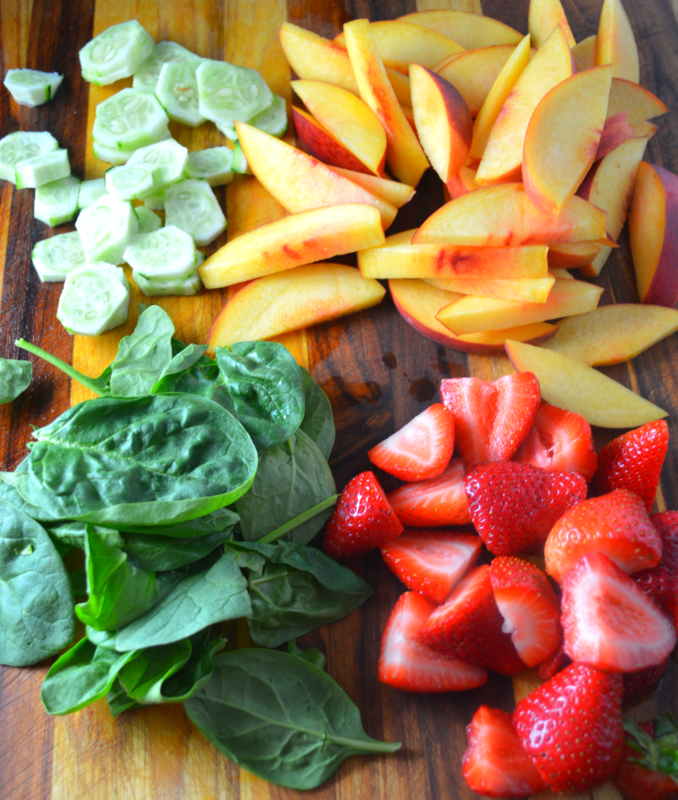 Add the rest of your smoothie ingredients and blend until smooth. Now taste the smoothie. You might need to add a little honey to sweeten to your liking or a little extra ice. 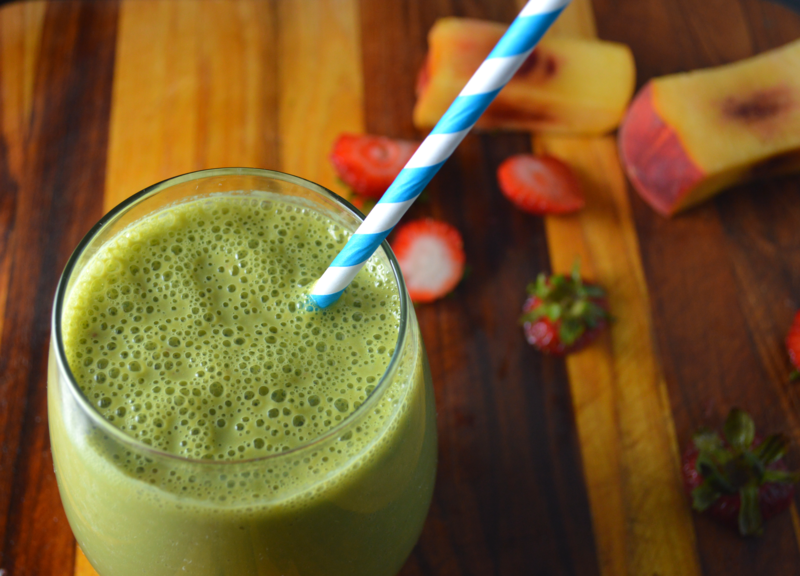 My hubby loved this smoothie, now I need to show HIM how to use the vitamix!